Our first stop in a four-day excursion to Connecticut was a real winner. Just outside our hotel was a charming little brick side street. Literally, in order were the following: a liquor store, Thai restaurant, cigar shop, Korean BBQ, psychic readings, and Irish pub. All the comforts of home. Not able to decide, my fiend and I meandered back and forth before deciding on a Frankenstein-esque Korean BBQ. The reason why I say this is because of the menu. Aside from Chinese, Thai, and Korean favorites, they also had an assortment of American breakfast classics, Mexican foods like burritos, and a double bacon cheeseburger. An odd mix if you ask me, but since we heard the cooks/owners say they were Korean, we both decided to go with an Udon noodle dish. He had a fried chicken udon soup while I went with the Korean BBQ spicy chicken udon Bento Box. 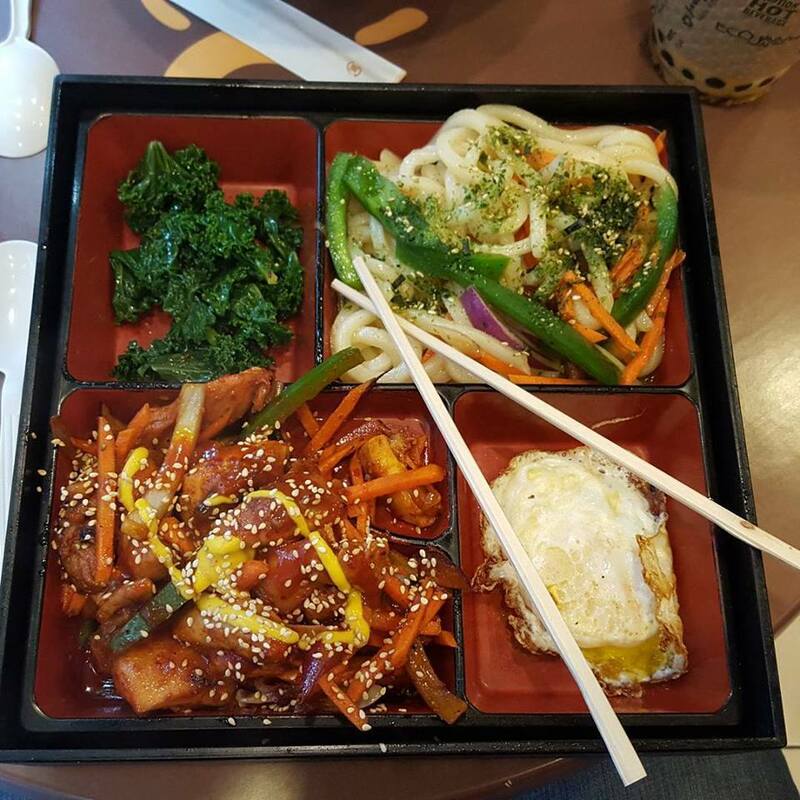 Priced at $11.99, the dish came served in enormous portions in a rather large Bento Box. The chicken was not too spicy, coming at just above mild, and dashed with a little mustard sauce and sprinkled with sesame seeds. The udon noodles were tossed with grilled carrots, peppers, and onions, done to perfection. The other two compartments contained a fried egg and cold kale salad, respectively. All was flavorful and fresh. The spicy sauce popped in my mouth while the noodles were almost creamy and were slurped up with ease. Nothing was too salty. As they say, “Everything tastes better with an egg on top”. They’re right. The fried egg was crisp, but the yolk was still gooey inside. The kale, which I thought was odd at first, acted as a nice palate cleanser when switching between the chicken and the noodles. There were some complex, gourmet flavors going on here. Served with chopsticks and a spoon, I would not allow myself to be the uncultured American and ask for a fork. I managed quite well, and actually impressed myself that I was able to eat the whole meal solely with chopsticks. This was at a time when I was still struggling. I’m a pro now. I did not know what the next few days in Hartford would have in store, but Sunberry became an instant favorite. I ate there for breakfast later in the trip. The food was a slam-dunk, and the atmosphere with tiny tables overlooking a little side street really made me feel like I was some place else. Let’s give this baby a rare 4.5 out of 5 stars. Great food, excellent presentation, decent prices. This review was originally posted here. The Sunberry Cafe is located at 65 Pratt Street in Hartford, Connecticut.